One layer of petals surrounding prominent central cluster of stamens (in which odd petaloids may appear). Two or more layers of petals surrounding usually prominent central cluster of stamens (in which odd petaloids may appear). Large outer petals surrounding distinct central crown, cushion or cluster of bunched petals or petaloids (Waratah form). Double bloom comprising several layers of petals mostly twisted, irregular or confused and mostly obscuring stamens. Of regular form - many layers of petals arranged symetrically to bud centre. Formal doubles are not suitable for salt laden winds in coastal positions. Bloom Colour variation where mentioned (e.g. "bright to deep red") allows for varying soils, localities and temperature changes during the flowering period. 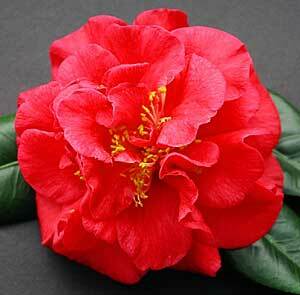 Established Camellias can be moved successfully if correct procedures are followed. It must, however, be stated that losses can be expected. The best time of the year to move Camellias is during the winter months. Avoid if possible moving over the summer months. At the drip line, trench a circle around the tree to spade depth. This is to sever any roots that are outside the drip line. If you're able to leave the tree for a few weeks before moving, it is beneficial to treat the root area inside the drip line with either Multicrop Plant Starter or Seasol to encourage new feeder root development. Prepare the new site prior to transplanting preferably with a planting compost ensuring good drainage. When ready to move, cut the soil from under the tree roots from opposite sides to free up the bottom. If it is not possible to replant your tree directly into its new site, or you are moving the tree to another site, ease up the bottom from one side and push under a large piece of hessian, tightly cover one side of the root ball with the hessian. Repeat the process for the other half of the root ball, leaving the tree's root system totally covered in hessian. Lift the tree's root ball in the hessian to the new prepared site. Place tree into prepared hole. Cut hessian to allow easy removal. Cover root ball with soil. Water plant thoroughly. It might be easier to build a trench around the root ball to help contain water. Pruning directly after moving is essential to compensate for root loss. It is advisable to prune at least a third of the foliage after transplanting. Staking is also essential for at least 6-12 months after moving. The best method is placing three stakes in a triangle shape and tie with hessian. Always ensure tree is kept moist at all times but do not overwater. Treat the root ball area with Multicrop Plant Starter or Seasol at weekly intervals for at least 4-6 weeks after transplanting.